One of the items on my “bucket list” was to write a book with the timeless principles that have evolved through my work beginning with “Clutter is postponed decisions®” and ending with “Together we are better.” While I like the other books I have written, I love Less Clutter More Life™ — and if I die tomorrow, I feel I have accomplished what I was put on this earth to do. (Having said that, my goal is to give a speech when I am 100, so I have no plans to stop yet!) I feel so blessed that my dear friend and colleague Louise Wannier was willing to collaborate with me to make this dream of mine a reality. I literally cried when I saw the photographs she chose to compliment my words. Less Clutter More Life™ is not a “how to” book — it is a “why to” book. The words in it will be just as true 100 years from today as they are today. It is designed to encourage you to acknowledge your deepest feelings so you can accomplish your work and enjoy your life. Focus on the path, not a destination. GET YOUR COPY TODAY FOR ONLY $17.95! Why can’t I ever find the papers I need? Did I save that on the computer or is it in my file? Sound familiar? Despite all our technology, paper is still the No. 1 challenge in households nationwide. It covers desks and the kitchen counter, gets stuffed into file drawers and now, saved in electronic form on the computer. Instead of solving our problems, computers and smartphones have created another realm of disorganization, with files and systems of their own to mix in with the paper. 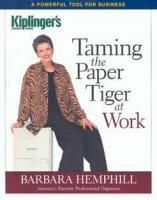 From the home office to the kitchen counter, Barbara Hemphill offers a step-by-step solution to purging, sorting and taming that paper (AND electronic) tiger. 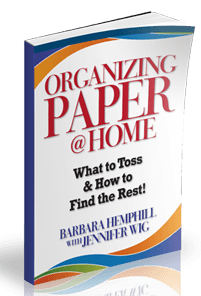 Her practical solutions will help you manage every piece of paper or e-mail that comes into your house. She’ll teach you how to make decisions about what to keep and where to keep and most importantly, how to find WHAT you need WHEN you need it! Also Available on the Nook™ and Kindle. 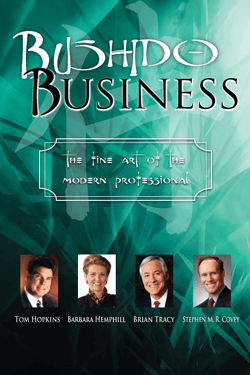 How do busy people become successful?Insight Publishing is pleased to present Barbara Hemphill, Tom Hopkins, Brian Tracy, & Stephen M. R. Covey in an exceptional compilation of resourceful people who will tell you how they learned how to be successful. They will share with you their secrets and reveal some remarkable insights on how to set goals in life and how to accomplish those goals. 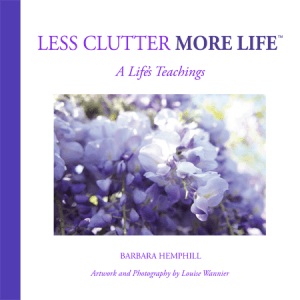 Download the book Love It or Lose It: Living Clutter-Free Forever by Barbara Hemphill & Maggie Bedrosian. Are you caught in the CLUTTER TRAP? Do you sometimes feel overwhelmed by all the “stuff” in your life? Do you find that clutter is putting a strain on your relationships? Do you waste time looking for the keys or papers you had in your hand a minute ago? Do you resist inviting people to your home or office because they will see the way you live or work?  You may be caught in the Clutter Trap – a state of cumulative disorder that diminishes your physical, mental, emotional, spiritual, or financial health. LOVE IT OR LOSE IT rescues you. Here’s a book that doesn’t waste words on theories. Using the five-step Clutter Campaign, real stories, The Love It Or Lose It Inventory, and practical tips, this book helps you Escape the Clutter Trap. Are your in-boxes overflowing? Do you have trouble finding files — and when you find them, are they crammed with useless material? Is your desk covered with printouts and Post-it Notes? Is your to-read pile falling over? If so, then the paper tiger’s got you in its grip.